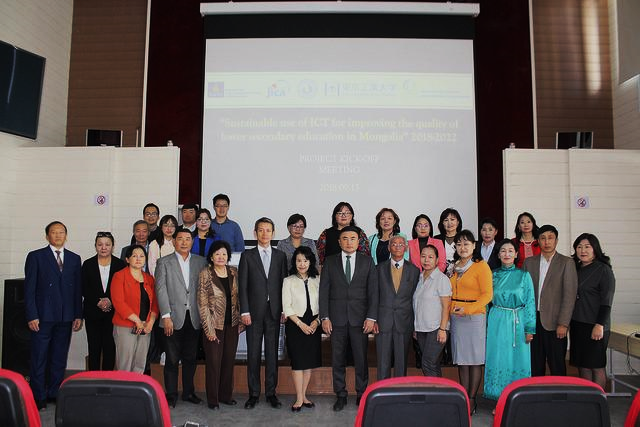 Ulaanbaatar, Mongolia – on September 13, 2018. through the sponsorship of the Japan International Cooperation Agency (JICA) and in partnership with the Mongolian Ministry of Education, Culture, Science and Sports (MECSS), the Tokyo Institute of Technology (Tokyo Tech), and the Mongolian National University of Education (MNUE) organized the project kickoff meeting for the “Sustainable use of ICT for improving the quality of lower secondary education in rural Mongolia through development of STEM teacher training materials” in the conference hall of MECSS. 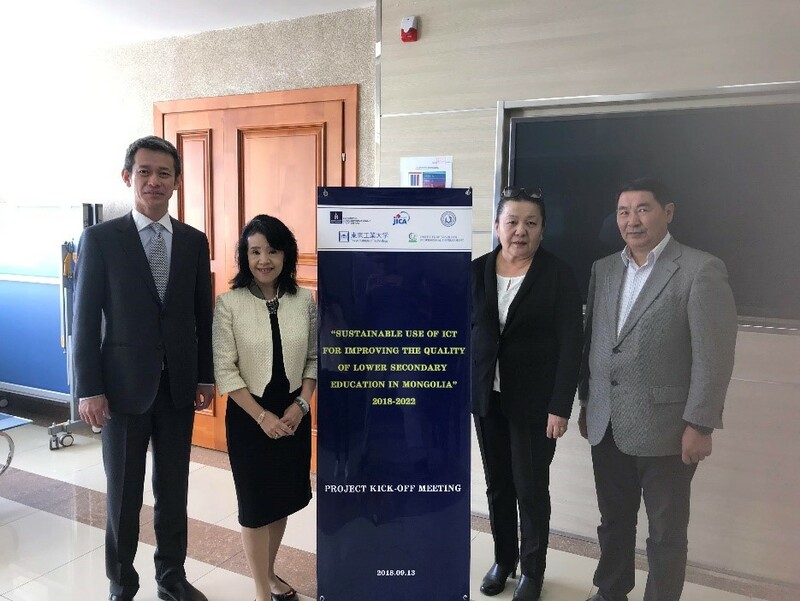 This meeting marks a major milestone for the starting of the 5-year JICA funded grassroots project which hopes to improve the professional competency of all Mongolian lower secondary school teachers in Mongolia to adopt student-centered education with the use of ICT. During the kickoff meeting, a diverse number of topics were discussed. In the opening remarks, Vice-President of MECSS, Mr. Ganbattar expressed gratitude for Japanese institutions and the long-standing support for the Mongolian education sector. Prof. Yamaguchi reviewed the history of collaboration with Mongolian teachers, and wishing that the activities in the next few years will bring bigger wave of ICT use in lower secondary education. JICA Mongolia Representative Mr. Sato expressed his praise for the successful implementation of the previous grassroots project and wished for the best of the upcoming project activities. Institute of Teacher’s Professional Development (ITPD) Director Ms. Oyuntungalag appreciated that the project will benefit rural teachers in upgrading their pedagogies with the use of ICT. There were two sessions of this conference. The first session focused on ICT policies. Mr. Lkhagvasuren from MECSS introduced the government effort in establishing Education Management and Information System (EMIS) from 2014. EMIS system is meant to better integrate student development, teacher development, HR management, and others aspects aiming to assist teacher’s decision and plan making. Following that, Prof. Tsedevsuren from MNUE explained the essential ICT skills needed for the information era, and MNUE’s effort in incorporating ICT training into teacher education. After that, Ms. Surenchimeg from ITPD introduced the involvement in teacher professional development of the institute. ITPD has been actively promoting the use of multiple teacher training and resource platforms, such as Bagshin Khugjil. The second session focused on the overall project introduction. Prof. Jadambaa from MNUE first gave an overview of the projects since 2004 that are supported by JICA, UNESCO, and Tokyo Tech to introduce ICT in teacher training and classroom teaching. 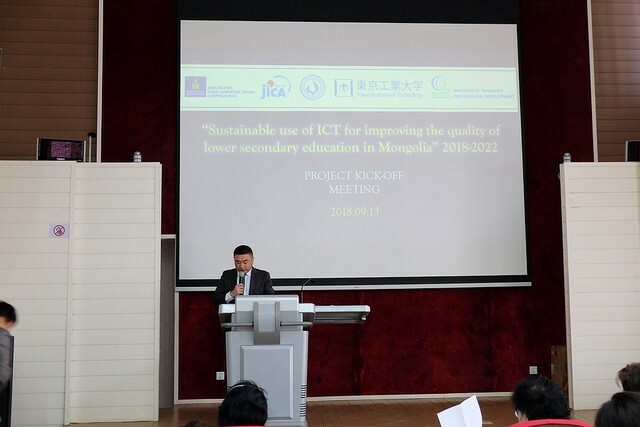 Prof. Sukhbaatar shared the outcomes of the previous JICA funded project “Sustainable use of ICT for improving the quality of primary education in Mongolia”. Through survey data analysis, it was clear that there were multiple positive impacts of the project, such as the increase in teacher training opportunity, positive effect on professional competency, and the increase in the use of ICT in education by teachers. In the next speech, Prof. Yamaguchi and Ms. Orgilmaa discussed the background, objectives, expected outputs, as well as the organization and requirements for the cluster trainings to be organized in October to November. Towards the end of the kickoff meeting, Prof. Jadambaa expressed appreciation towards the efforts given by the project stakeholders, and wished all the best to the project success. The kick-off meeting was an overall success with high hopes for a successful project implementation in the years to come. The meeting assembled education sector leaders, development professionals, and Education Culture Department (ECD) directors from all aimags and UB districts of Mongolia. Below is the list of participants.